One of the places we’ve talked a lot about this year is our Tuesday afternoon lunch with the homeless, Daily Bread. Most Tuesdays, after eating a delicious meal with our houseless and unemployed friends, Tessa, Kieran, Erika, Henry, and Annie and I walk across the street to West Park to debrief the experience. Actually the Fellows, Erika and I debrief and Henry and Annie swing on the monkey bars and play on the slide. Anyhow, a few weeks ago I shared with Tessa and Kieran one of the things that I love most about Daily Bread; I shared with them that I find that room to be a place of deep honesty. Erika and I love our children deeply, but there are times when parenting can really stretch us. We had been experiencing one such day when we asked a man we’d never met before if our rowdy crew could join him at his table. The older gentleman introduced himself as Tyrone and proceeded to encourage us as parents. As our kids spilled their food on the table and floor and knocked over their drink cups, he encouraged us to cherish these fleeting moments with our young ones. He encouraged us to hold on to these memories, and to hold on to our kids. Tyrone then shared that two of his three boys had been murdered recently. He said, “I drink myself to sleep most nights so I don’t feel the pain.” And with tears in his eyes and a quivering voice he again encouraged us to hold on to our kids. There aren’t a whole lot of places in our lives where people are as honest as they are at Daily Bread. When you are houseless, jobless, toothless, shower-less, or hopeless there really isn’t any way or point in trying to pretend otherwise. And so we eat with, pray with, and try to be honest with our friends there and take that lesson in honesty to our larger community. Because even though we have the means to dress up our brokenness in nice clothes, and mask our stench with organic soap, the truth is we are broken and in need of a savior. And that is no different than our friends at Daily Bread. Its just that they are maybe more acutely aware of their need. On Friday April 5th the Twichell family grew by two: George Augustine and Jack Francis. George is a family name for both Erika and me, and Augustine is a friend we met at Daily Bread earlier this year. Jack is also a family name and means God is gracious. My grandfather’s middle name was Francis and Saint Francis isn’t the worst role model for a young man. Mom and babies are healthy and enjoying the love and affection of Henry and Annie. We thank God for your prayers throughout the pregnancy and can’t wait for you to hold them. Or help us carry the carseats. Actually, go for the latter. We are super excited for what God will do in and through our cohort next year. Applications are still being accepted through July 1st! If you or a loved on are on the fence as to whether to apply, or maybe you are wondering what a year with Agape Year is really like, we’d love to put you in touch with one of our alums. In the US, when you hear “s/he stepped up” to accomplish something or help out, it connotes a bit of a heroic effort. One steps up in a situation where everyone else is stymied or it is a task no one wants to do or the task is outside of the person’s responsibility. It is a good thing. Saturday. Within 2 hours I had a reply, “We’ve got a one!” She collected the wheelchair and then delivered it to the team, a couple of hours away, so they could bring it down. Lots of people in South Carolina stepped up to help a little girl they didn’t know. A couple of weeks ago, a 5-year-old girl in our school in Flor told our psychologist that her step-father was abusing her and that he had also thrown her 7-month-old brother on the floor. By that afternoon, they and their 2-year-old brother were in our Children’s Home, with a caretaker hired to care for them. There were no discussions about capacity, about affordability in adding 3 children and a caretaker to the already stretched budget. The staff at the school and Children’s Home stepped up to save these children from further abuse. Edgar, 8, stepped up and took the 2 year old under his wing, teaching him how to say grace at dinnertime! Last Friday I got a call in the late afternoon. “There is a big fire behind the church. We are evacuating all the children. Can they come to Casa LAMB?” We didn’t have a team that week and Gloria and Dulce had spent the entire week cleaning every inch of Casa LAMB, even scrubbing the wall behind the stove! When they heard the news, they stepped up. They knew that all their work would be undone in minutes, yet with big smiles, they immediately began preparing the house to receive 42 children and 8 adults. They graciously oriented the Children’s Home cooks to the kitchen and announced they would be back Saturday morning, their day off, to redo all the work they had already done. On Saturday, I went to Mengui’s house. Mengui and his wife, Damariz, are the house parents for the adolescent boys at the Children’s Home. They built a house neighboring our property. Marvin, one of our boys, had had difficulties and is in a wonderful program called, “Teen Challenge.” Marvin and a mentor came to spend the weekend with “family.” Marvin doesn’t have any viable family – biological family. But he has a large and loving spiritual family. Mengui and Damariz hugged him and told him they are his parents now. This is not part of their job description. They stepped up and stepped in to love a child who needs it so very much. Several of the adolescent boys were there as well as Mario, our grounds supervisor. We were all there to support, encourage, and love Marvin. We celebrated the changes in Marvin that he has prayed for and wept with him as he told us of his new, deeper relationship with Jesus. While I was there, I noticed a big cart in Mengui’s living room. “What is that?” It is a bicycle with a food cart attached to it. Mengui and Damariz have started a neighborhood worship community in their home. Many of the members are single mothers who have no work. (Unemployment in Honduras is 50+%) The Lord told Mengui to help them. So, he took out a loan to buy this contraption and they are preparing to start a business together cooking and selling Chinese food! Damariz is a cook at the Children’s Home so is very experienced in cooking in large quantities. They both have the reputation of being excellent cooks! They, the women, and Carlos, one of our boys who has graduated from the program, will run the business. Carlos, also unable to find work, dreams of being a chef. Why all this stepping up? Because we follow the Lamb wherever He goes. Because Jesus calls us to step up when we see people in need. But the real reason is because we are family. And that is a very good thing. It’s Missy here again. It seems like such a long time ago that I wrote the last post and it was back in February. If you want to jump down to the prayer items feel free. Also, if you have emailed me a personal reply and I have not gotten back to you, my sincere apologies. Our life here is much busier than it was at the beginning and I am woefully behind on replies. 1. My feet are tan. In fact, they even have tan lines. Never in my life has any of me gotten tan. Burned? Yes. Freckled? Yes. Pale, like alabaster? Yes. Tan? No. Until now. It’s kind of weird. I’ll have to see if I can get Evan to send a picture. 2. Evan bought a whole bag of “limes” from a lady walking around our street with a little boy (they looked like they might have come from Guatemala). They looked hungry and she said she was selling them to buy food. Only the “limes” were sickly little things and when I cut them open they were bright orange inside. I don’t know about you but I’ve never seen an orange lime. Turns out they were just very small oranges that weren’t full-grown, ripe, or healthy but Annabelle and I still slaved to make some juice and it was quite delicious. 3. One has to be careful what colors one wears. The two political parties are represented by red and blue. If you wear red or blue people automatically assume you are affiliated with a political party. If you paint your house or bike or anything else red or blue, it is assumed you are making a political statement. In fact, I wore a red shirt one day and a bus didn’t stop to pick me up. I’m still convinced it was because I was wearing a red shirt. It doesn’t matter that I am not a resident, that I cannot vote, that I really do not know anything about either party, or that I have both red and blue shirts. Alas, I have (mostly) retired that red shirt. I decided it is notworth missing a bus over. 4. As you know, Annabelle is a bright little light everywhere she goes and she was given a second-hand bike by our wonderful neighbors (we couldn’t ask for better neighbors). She’s now riding like a champ and wants to go up to the park every day. It’s a little big for her but she is able to start and stop on her own. Everyone knows her by the unicorn helmet with it is neon blue mohawk. No one here wears helmets when they ride bicycles except our little unicorn. 5. We have received one piece of mail. That’s right – ONE! It was truly an exciting day in our household. The mail was actually a beautiful and sweet birthday card a dear friend sent me. But that’s it, a single solitary piece. Feel free to try though, if you are up for an experiment. Our address is #3 Third St. San Ignacio, Cayo, Belize, C.A. In fact, if everyone who got this email sent Annabelle a letter, it would be wonderful. Just don’t forget international postage! 6. Almost last and certainly not least, Annabelle keeps wondering how they get the mashed potatoes into French fries. Truly it is a question for the ages. 7. And topping the list of funny and surprising things… I got pooped on by an iguana. That’s right. Poop on my hat. And my hand. And showered around the towel on which I was sitting. Liquid iguana poo. Eww. We were sitting at the river enjoying the beautiful clear water. Annabelle was playing and I was relaxing under a large tree. We had heard howler monkeys, countless tropical birds, and seen basilisks, and large green iguanas. Suddenly, it sounded like rain drops falling all around only there weren’t any rain clouds. And then I saw what fell on me and around me and we saw the gloating and relieved iguana. Eww. Eww. Eww. Of course, we all laughed. I imagine in some country somewhere being pooped on by a reptile must be some sort of blessing. Thank you for humoring me by reading this little list. It’s certainly different living here. And fun and sad and maddening and everything in between. We are loving it, even the hard stuff. Thank you for joining us on this crazy adventure. I am now up to what I consider full capacity for counseling. I am primarily working with the students at the three Anglican primary schools (primary schools go from k-8th grade) in the area. I see about 20 children per week. I have a number of family members with whom I’m regularly in communication and then teachers, principals, and community members. I have some appointments outside of school hours. I have now met with people in at least 8 locations and the mobile office thing (without a car) is not easy for me. And then there are the countless conversations that happen in doorways, on street corners, and outside. Clearly, being flexible is important in this work. Of course, people here are often not as concerned with confidentiality in the same way I am, but I have been practicing long enough that it is ingrained in me to be very careful and I have always been pretty conscientious (go ahead and laugh, since we all know it’s true). I mentioned previously that I would be working on my continuing education. Here are the continuing education trainings I have completed – Human Trafficking and Exploitation, Clinical Supervision, and I am currently working on a long training on Post-Traumatic Stress Disorder. I am quite interested in learning about complex trauma and intergenerational trauma as I am working with a lot of children and families who could be case studies in that subject matter. I have several other trainings lined up most of which are particularly relevant to my work here. We have some lovely friends here. Not only are we friends with the Alenskis’ but we are friends with our neighbors (see about the bike earlier) and they even invited us out to their family farm in the village. It was amazing and refreshing. They have innumerable fruit trees and flowers, various livestock, and even a little fish pond they keep stocked. We also have some friends (thanks Kimberly for the introduction) who have two kids and we try to see them when we can on weekends. They are lots of joy and good conversation. There are many good things happening here – to us and through us. I think we are all being challenged and we are all growing immensely spiritually here. It was and is good for us to be away and to have this special time. We continue to be incredibly grateful for God’s provision for us. As we mentioned previously, we have had some unexpected expenses back home. God continues to be gracious and generous with us. Thank you to everyone who has or is supporting us in our work here. We continue to be floored by your generosity (you know who you are). Believe it or not, our monthly expenses are less than $1,600 for all three of us. Of course, there are things that come up over and above that amount – as I’m sure you can imagine. Please pray for Mary Beth, David, and their little man. The baby is due any day now (even though he’s only 36 weeks old). Please pray for a safe delivery and the health and wellness of mother and son. Please pray for Mary Beth and David as they adjust to having a child. Please continue to pray for Annabelle and friends. I think she is continuing to experience some cultural dissonance and seems to daily have difficulties with some of the children in her class – particularly the girls. Overall, school is going well for her and we have good family time, but I know she really misses some of her friends in the States and just hasn’t connected with anyone at school in the way I would have hoped for her. Please pray for Evan’s knee. We do a lot of walking and he has had some knee troubles for several weeks. Please pray for healing. I have also started to experience some cultural dissonance – primarily with work. Cultures have different values and some things I value highly – like honesty – are not valued as highly by many of the families I am working with. It is also difficult to feel like one is making a difference or connecting with people when one has no idea of the truthfulness of what they are saying. That is just one example of the cultural dissonance but there are quite a few in my therapy work. Cultural dissonance makes self-care especially important so I am trying to be cognizant that I am not working too much and I am doing other good things. Until next time… Don’t forget to get your kids or grandkids or nieces and nephews to paint a picture or write a note and mail it to Annabelle. I bear several titles in Uganda; Reverend, Archdeacon, Auntie, and sometimes Mama. The latter two sometimes come from my students, who sometimes see me as a parent (and it’s an incredible honor, though I feel my age!). Over the last few years, I’ve grown closer with a couple of the women students, and at different times, two have stayed with me. We’ve had many long conversations and shared several times in prayer, all of which have been precious to me. Last year, Esther became engaged to one of her classmates, David. I was thrilled for both of them, and hoped to be invited to the introduction and wedding. Esther did me one better: she asked me to be a ssenga, or auntie, for the introduction. 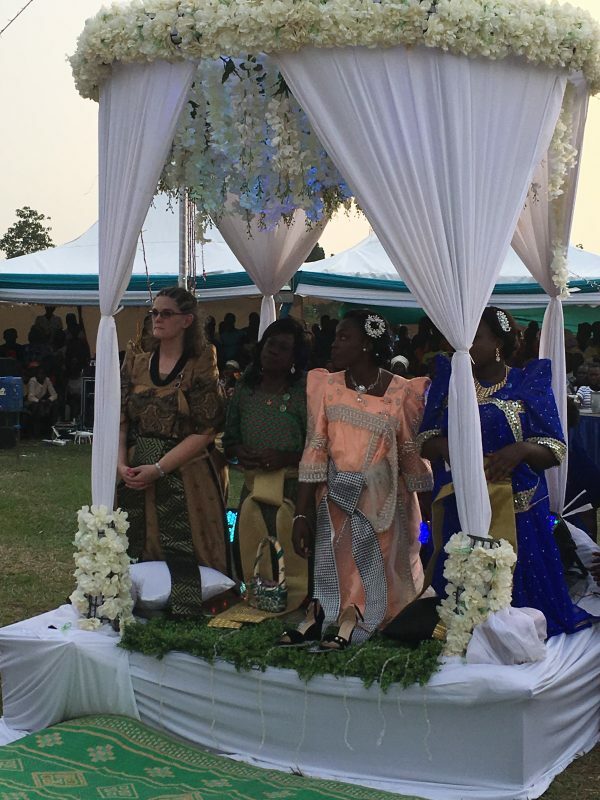 The ssenga is the paternal aunt, and since I’m certain that Esther has paternal aunts, I’m not quite sure how she was able to bestow this honor on me. The ssenga has a number of responsibilities culturally, and I think I fulfilled none of them. 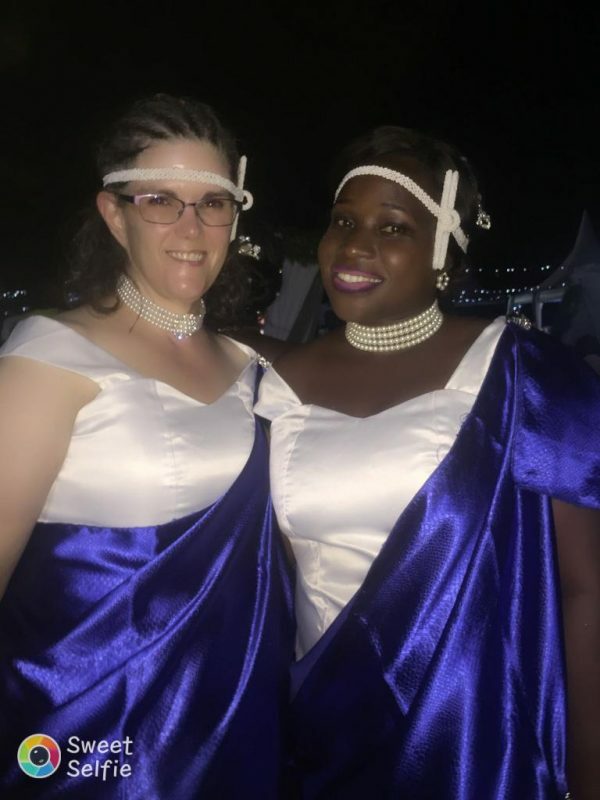 In Uganda, there are two ceremonies. First is the introduction, which also doubles as the cultural marriage when it is registered with the government. 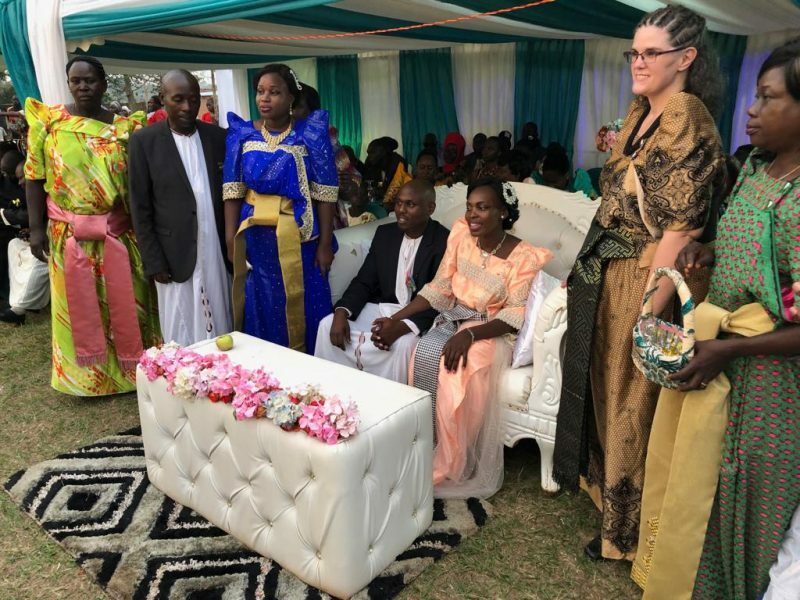 The introduction is when the bride introduces her groom to the community, and the groom brings the dowry and other gifts for the family. While this is enough for a legal marriage, Christians then go to be wedded in church. Esther and David had their introduction on a Saturday, and the wedding on a Sunday. Though exhausting, I think that’s the way I’d do it; I’m not sure I could handle being married yet not being able to live as though I’m married. I love the concept of the introduction and how the whole community is involved. Of course, it’s a very long day: both the bride and groom have emcees to carry the day along. The bride’s side sends out several iterations of ladies (often beginning with young girls) from which the groom’s side is to “find” the bride. She is not among them, obviously, and they are given gifts as they go back. I think this was the third set of ladies who went out, and this was their second costume change. The gomesi were gorgeous, and velvet. I’m not sure how they survived in the heat. The men are very smart in their kanzu. The groom’s emcee is in the blue blazer, and he did a fabulous job of keeping the function moving along. Finally, the bride comes with much pomp and circumstance with her aunties. She walks around the venue a couple times to much ululating from the crowd. When I asked Esther how many people would attend, she casually replied, “About a thousand.” As near as I could tell, that’s nearly how many people were there. Here comes the bride! Isn’t she stunning? With all the embellishments, that gomesi had to weigh nearly ten pounds, and the sash was another two or three. Then the bride and aunties kneel for some of the speeches and prayers. When the groom’s emcee asked the bride’s emcee to ask the priest to bless the lunch, he asked, “Which one? There are like a thousand here.” And it was true. FYI: the bottom of that gazebo was glass. It was hot, and I was sweating. It’s a miracle I didn’t slip right off there, especially since I’m not sure the woman to my left was supposed to be there. This is when the groom’s entourage brought the gifts for the dowry, and had he not brought all that the families had agreed to, there would have been trouble in paradise. Thankfully, that was not the case. 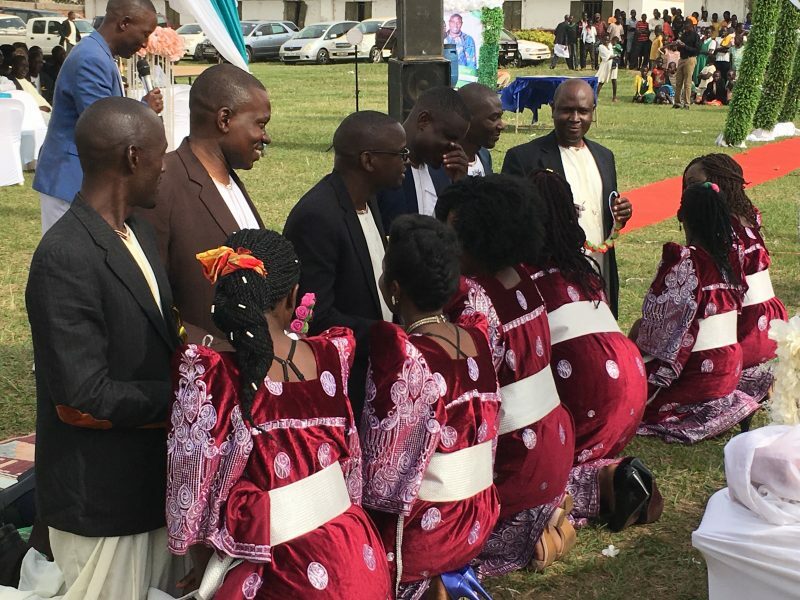 One of the things the ssenga is to do is to “find” the groom (he had been sitting in the back) and present him to the bride. I didn’t fully realize that this was my duty, and when another woman came and took the little basket I was holding, I chose to not make a scene. I wish I had. When it came time to pin the corsage on David, since I didn’t have it, Esther took it and pinned it on David herself. The emcee was quite surprised, and recovered nicely by exclaiming, “Esther! You have taught us something new today!” David said to me a bit later, “Reverend, I thought it would be you [to pin the corsage].” I am utterly heartbroken about that. They have been found! The best man, Saul, is one of David and Esther’s classmates. We had another gomesi change, but I don’t have pictures of that because the person who had my phone completely depleted the battery taking many photos. Since the function was running late, we opted to remove one gomesi change and moved to the last costume change for the presentation of other gifts. For this, we were seated on a mat in front of the gazebo, and as people brought gifts, we’d rise to our knees to greet and shake hands. Esther’s cousin Rose and I in our last costume change for the receiving of the non-dowry gifts. I would completely misspell the name of the outfit (mushanana? ), but it comes from Western Uganda. The church wedding was the next day, and I was honored to serve as part of the officiating team. My role was quite small, but clergy have the best seat in the house. 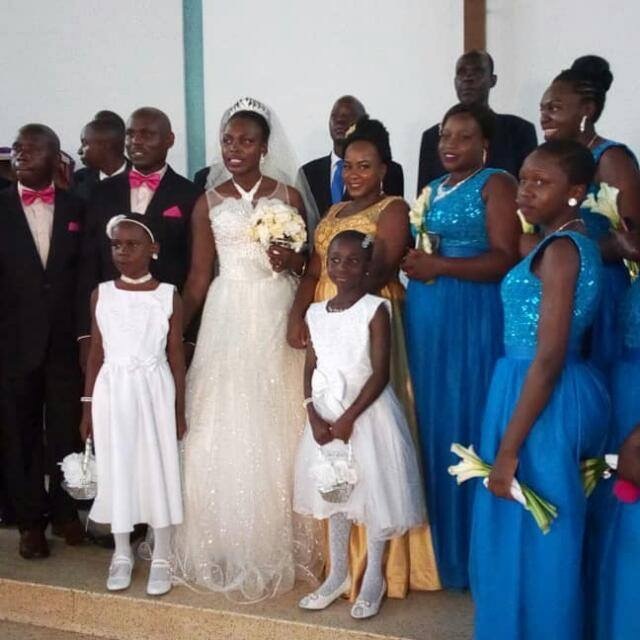 In addition to having the privilege of serving as ssenga and an officiant, most of the groomsmen were David and Esther’s classmates, so I rather felt that my children had come home from university. 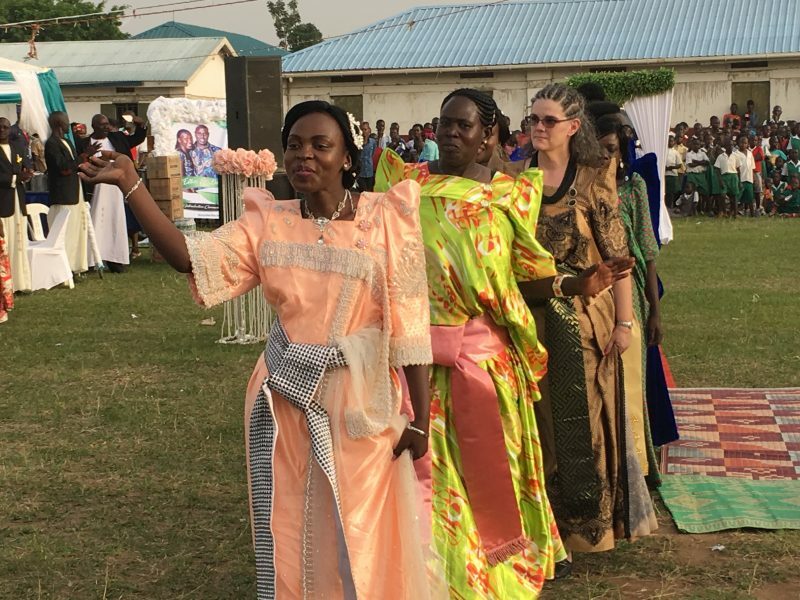 Since this is the dot-com generation, photos of the functions were flying around WhatsApp, and I received several photos of myself from students who were in Mukono, as they were unable to attend. That was a riot. Yet the fact that they wanted to show me that they had seen me blessed me tremendously.